The Owatonna Curling Club is a small, two-sheet club dedicated to the sport of Curling. Founded in 1968, we are small but very active! 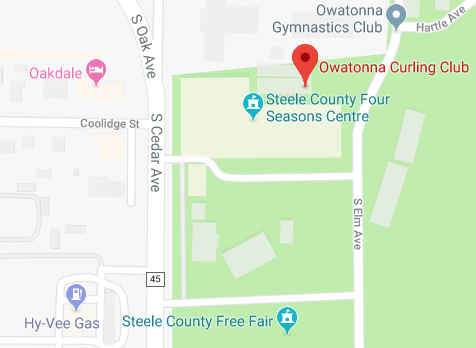 Located on the Steele County Fairgrounds in Owatonna, MN, we have leagues on several evenings. We are always looking for new members or teams, so come and give us a try! Finding us is easy - we are directly across from the Steele County Fair Grandstand, on Elm Avenue. From I-35, take 14 east towards Owatonna. Take the Owatonna exit, following the signs to Steele County Fairgrounds. Turn right off the ramp. Take the next right at the stop light onto SE 18th (by Walgreens), then the first left on to South Elm Ave. The curling club is on your left, just after the Stop sign.